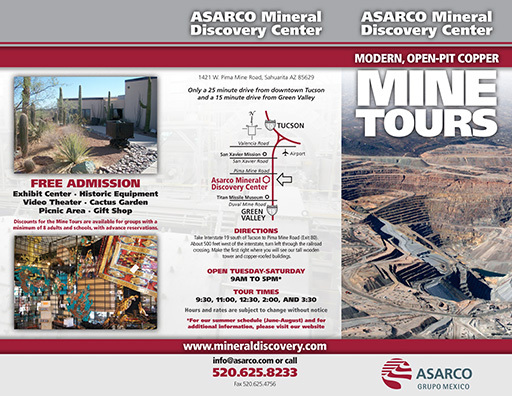 This brochure for the ASARCO Mineral Discovery Center was fun on a few levels. 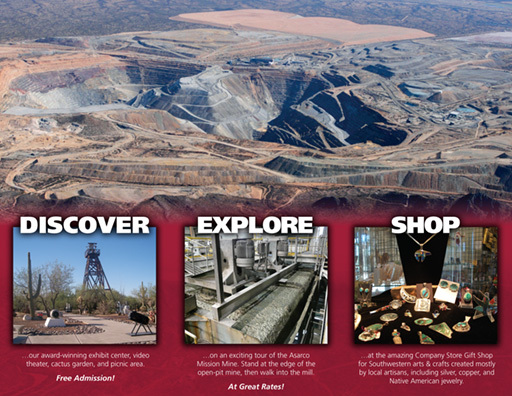 First there is just the general interest in the mines of southern Arizona, a decent economic input for our area. I’ve taken my kids down to the Discovery Center and taken the mine tour. Then there is the saturday morning shootout, a weekly ride that see pros and national team athletes come out and ride every Saturday, and that goes around the mines as well. Also, an old friend help set up the Discovery Center and the exhibits a dozen plus years ago, and I still have a few of his old bookshelves in my house. And the last bit would be that there was not a very large budget for the brochure so it was a fun challenge to make a nice piece without costing the customer much money [like in the “took less than 2 hours” range]. I just may need to head out to the Center again as the mines have been working hard as the price of copper has gone way up. Click on the either of the following images for a pdf version of the brochure.